The Mudroom (Side Entrance in the PAL versions) is a room found in the beginning of Gloomy Manor in Luigi's Mansion: Dark Moon. It can accessed by going through the right door in the Entrance. The room has a several coins that are stuck in webs. During the first mission, Poltergust 5000, the fan on the ceiling holds a key and the carpet can be rolled up to reveal a hidden switch that can be stepped on to make a panel in the wall drop several coins, bills, and gold bars. When Luigi first enters this room in the aforementioned mission, he can spot Polterpup outside. On other missions, the Mudroom's fan will not have a key and the switch will not yield any money. Luigi can look through the windows here to see the Mudroom Exterior. The door on the right leads to the Mudroom Exterior while the door on the left will take Luigi back to the Entrance. 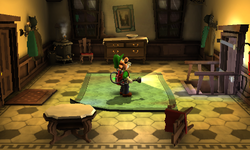 During the second mission, Gear Up, a Boo can be found by shining the Dark-Light Device on the missing table located by the southern wall. This room may also be one of the rooms randomly covered in spider webs during the fifth mission, Sticky Situation. This page was last edited on September 11, 2017, at 00:27.